This winter my skin has been the worst it ever been. My chin/nose area has been so dry and red and irritated, I’m finding it impossible to keep on top of a decent routine. With that being said, I’ve completely stripped my skincare back to basics and am trying not to overwhelm it. When I received the new Dermalogica Intensive Moisture Balance* it sounded exactly what my skin needed! I was hesitant to try it as I didn’t want to introduce anything new into my routine which may have a negative effect. I did however give it a go, and it’s really wowed me! I been using this as my PM moisturiser - don’t worry, it’s not as thick as it may sound, it’s actually just like my other creamy products I like to use, so I’m more than happy to use it everyday despite its intense name! If you have dry skin like me, I don’t think you’ll find this to be too heavy to use everyday, especially in the winter months. Before I apply this, I go in with a cleanser, toner, facial essence, and then a tiny bit of oil. This locks everything in place and seals that moisture deal! Now, the price is fairly up there for a moisturiser. At £68 it’s not affordable, however if you’ve been struggling with dry skin over the cold months I think you’ll be really impressed with this. A few more things to note...it has Vitamin C which is amazing for brightening the skin and improving your skins texture and tone. I love Vitamin C, it’s such a hero ingredient in my opinion. It’s also in a handy squeezy tube which is completely opaque to protect the product from being effected by sunlight (yes, that is a thing!). Overall, I’m so happy this landed in my life. It’s the perfect product to save dry, irritated skin, and the balancing properties are what my skin craves this time of year. Let me know if you’ve tried this, or what other products you can’t live without in the winter months. I love skincare, but there's certainly a time and place for spending an hour in front of the mirror applying 3 different masks, 2 cleaners, 3 serums and an oil. Oh, and don't forget, toner, eye cream and of course at least 4 different moisturisers. An exaggeration maybe, but, day-to-day that's just not my jam. 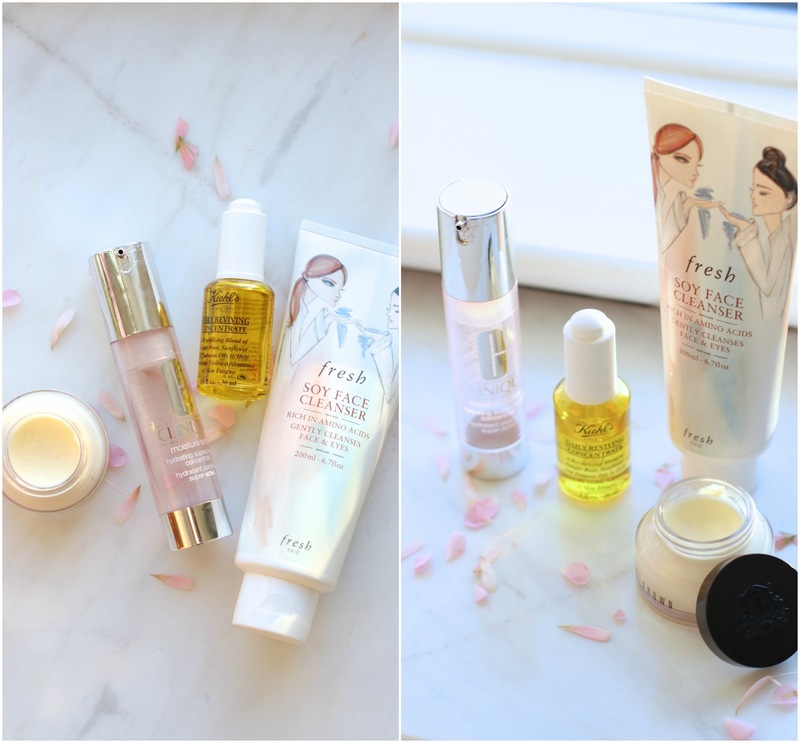 Today I'm going to focus on a quick (AM) skincare routine which will leave your skin prepped and ready for makeup, but without taking up precious time. These products are particularly aimed at those of you who may suffer with dryer skin in these cold winter months - so let's get into it. Of course cleanser is the first step. I love the Fresh Soy Face Cleanser for both morning and evening use. It leaves my skin feeling so clean, yet nourished and brightened at the same time. The soy protein helps to maintain skin health, whilst the cucumber and rosewater extracts keep everything nice and balanced. The consistency is like a gel/cream hybrid, so it's lovely and refreshing in the morning. I'll use a pea sized amount all over my skin, and remove with a wash cloth. This is the most important step for me in the morning, so everything else that follows is just a bonus! 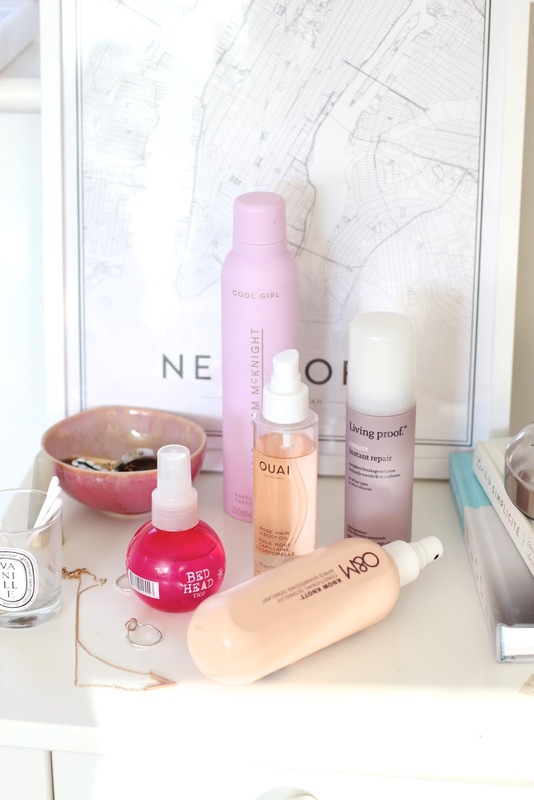 A serum is super important for me in the morning as I love the dose of hydration it gives. I've nearly finished up my Clinique Moisture Surge Serum and I desperately need to run out and grab a new one. If you suffer with dry/dehydrated skin this is a great product to have on hand. It's a very lightweight formula which sinks in beautifully, leaving your skin feeling super nourished and hydrated. Can't be without this at the moment! The final two products I like to mix - just makes things a little bit easier and I much prefer to use facial oils in this way when I'm applying them in the morning before makeup. 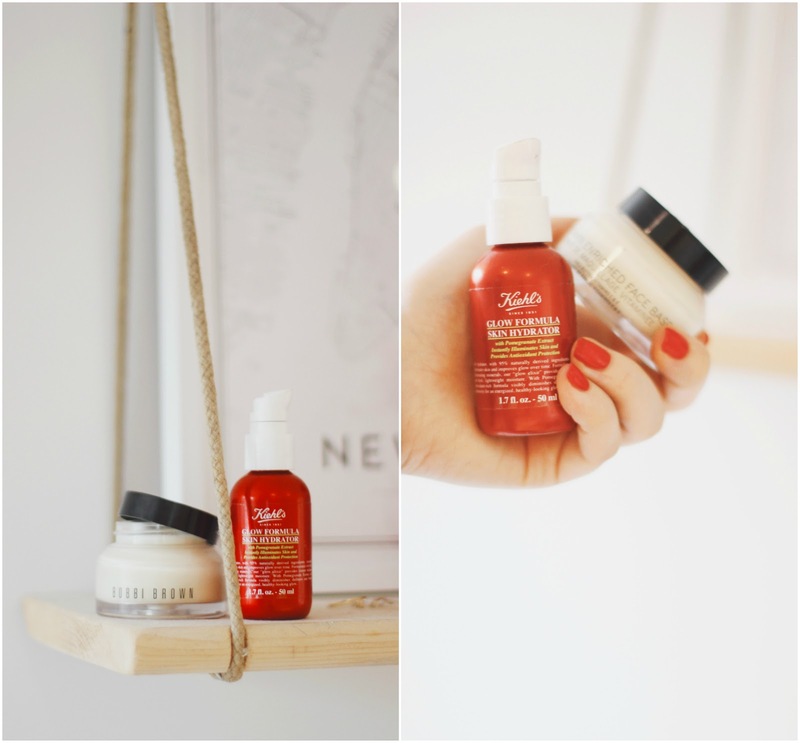 The two products in question are the Bobbi Brown Vitamin E Enriched Face Base, and the Kiehl's Daily Reviving Concentrate. The BB Face Base is such a an amazing morning moisturiser. Never have I used something which is so nourishing and moisturising, yet sits beautifully underneath makeup. I'll scoop a little bit out, then add a few drops of the oil for ultimate hydration. The oil is great at brightening the skin and adding a load of radiance. Can't really ask for anything more than that when I wake up looking like a zombie! When the winter months roll around my skin instantly changes. It becomes so much dryer, and layering foundation, or any type of base product for that matter, is a real struggle. I’m a huge primer advocate, I really do believe that they can change the way a foundation looks and lasts, depending on the one you reach for. I also love to mix them. Using a pore perfecting primer where you need it, and then a glow inducing primer where you want an extra glow – you really can change up the way your skin looks, even before foundation. Today, I’m pretty much going to talk about layering a hydrating primer, over another hydrating primer. Ground-breaking. But seriously, if you have dry skin like me, this is a game changer. The Bobbi Brown Vitamin Enriched Face Base is one I reach for first. This is more of a skincare product, but I just love to use it before I go in with makeup. I saw a few people online apply this with a beauty blender, and I’ve certainly hopped on that train too, it picks up the prefect amount of product. It’s quite a thick cream, so the beauty blender helps to push it into the skin and thin it out slightly. This feels like silk on the skin, it’s absolutely lovely. I thought I would go through this stuff like water, but so far I’ve barley scratched the surface and I’ve been using it for the past month or so. Bobbi Brown skincare is more of a luxury I would say, sitting just under the £50 mark it’s not cheap, but well worth it in my opinion. My makeup always lasts so much better throughout the day, and remains fresh and nourished. I hate it when you look in the mirror after a few hours and your makeup has sunk into dry patches you didn’t even know you had…I don’t get that with this I’m glad to report. Once that has had a few minutes to sink in, I’ll go in with the Kiehls Hydrating Glow Moisturiser. Not only does this give extra hydration, but it also gives you a lovely glow. Need I say more?! This is slightly tinted when you pump it out, but the colour doesn’t really translate on the skin or offer any coverage. It’s more of a very subtle bronzey/champagne tint to help make your skin look a tad healthier. I use 2-3 pumps and apply this all over, focusing on the tops of my cheeks and anywhere else I want an accentuated glow. Side note, it also smells of lemon drizzle cake which is certainly a pleasant way to kick off the day. If you’re into mixing products in with your foundation this is a great one to try that with. It’ll give a dewy finish, with that added nourishment we all crave in the Autumn/Winter months! 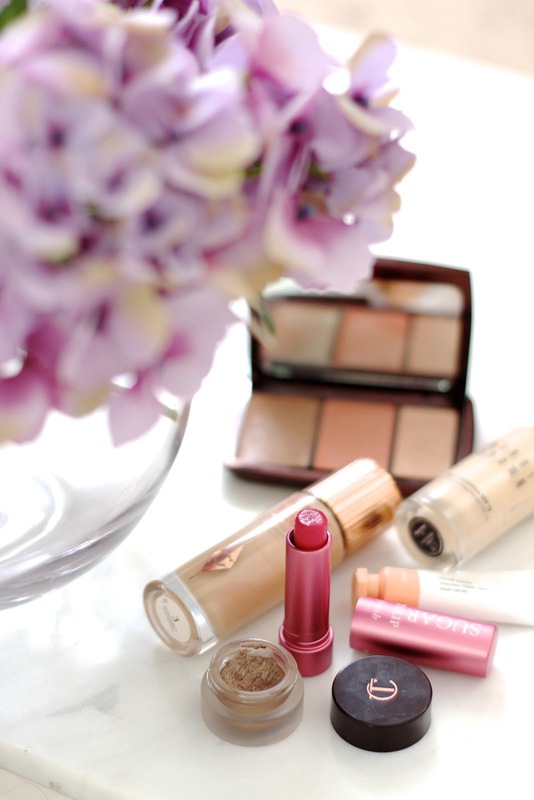 A Quick Autumn Beauty Rundown. I feel like minimalism is a real trend at the moment. In terms of beauty, the whole “Instagram makeup trend” is slowly starting to be limited to just Instagram, and people are going back to more relatable looks that can be achieved in 5 minutes. I’m all for makeup being an art form, but Monday to Friday that’s not going to cut the mustard, and I need something a bit more like “ah yes, I can do that with my eyes half shut holding a coffee in one hand and a beauty blender in the other”. Anyone else? 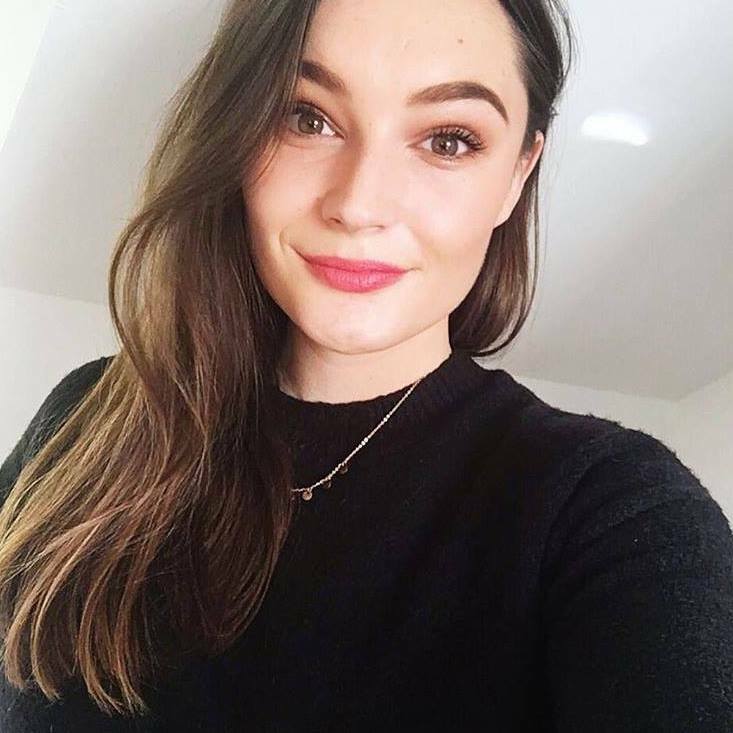 I’m loving that brands are cottoning onto real women, making beauty more relatable and versatile so we don’t have to carry a whole beauty hall around in our bags – it’s easy to be streamlined. 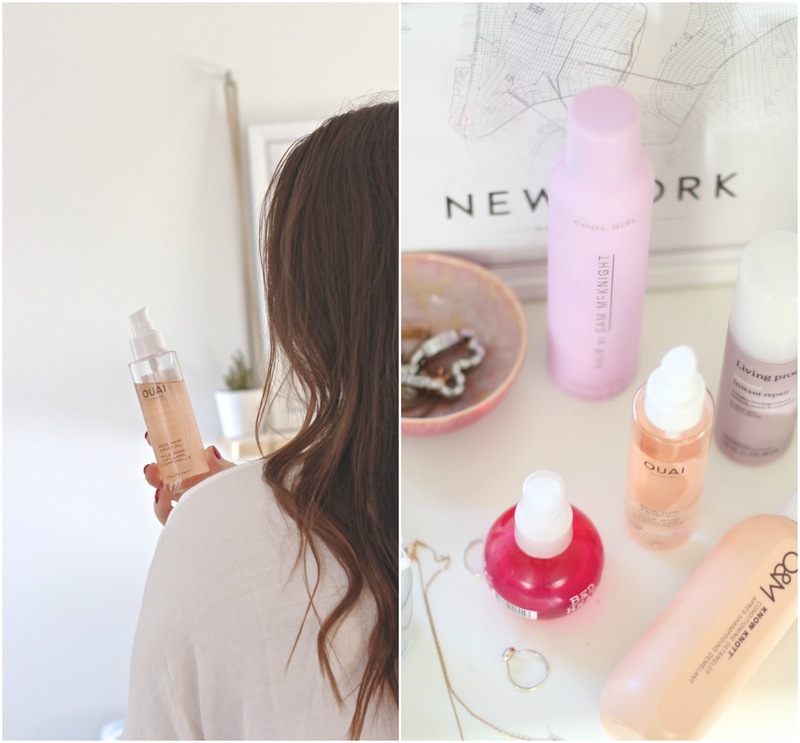 I’m not going to share a whole face in this post, but I will talk about a few products I love for that effortless look in the mornings. I believe these to be very universal, and most importantly, give off great results with minimal effort. There are some days where foundation isn’t an option and a touch of concealer is really all I have time for. With that being said, I do feel a bit more me when I have a slightly fuller coverage base. If, like me, you prefer a light-medium coverage then I think the Bobbi Brown Skin Foundation is worth hitting up. It’s not a thick product, so you don’t have to stand there for 10 minutes blending, it seems to effortlessly mesh into the skin. I use my beauty blender and 2-3 pumps which covers nicely. The name of this is great, it really does just look like skin. It’s not too matte, nor is it very dewy so it’s a pretty safe bet. For setting the skin, I always reach for my Hourglass Ambient Powders. A; because they never look cakey, and B; because they can also double up as a highlighter (a subtle highlighter that is). I have the trio of powders and I love to just mix them all together. They are beautifully formulated and give your skin a lovely airbrushed glow, whilst setting your foundation in place. I’m not sure what magic is in them, but I’m all for it! They are pricey, but I do find they last ages as you don’t need a heavy hand when applying them. I find a big fluffy brush the best to use for these. I barely do a full blown eyebrow routine when I’m getting ready for work. The most I’ll ever do is a brow gel, and I’m ok with that. One I’m loving at the moment is from L’Oreal, and it’s their Brow Artist Plumper. This is super affordable and I find gives my brows the perfect amount of colour and definition, whilst setting them down for that day. A couple of others I love are from Benefit and Glossier, but this one does the job at a reasonable price point. I do tend to wipe off the wand a bit before I go in and apply, this just stops the product from crisping up due to having too much dispersed at once. For the eyes, I will rarely faff with liner, unless it’s in the form of a black eyeshadow I can quickly smudge out. I do still want something on the eyes, so I tend to use a cream shadow stick, or an eyeshadow duo. For the latter I love the Nars Duo in Kalahari. This contains a shimmery taupe, perfect for all over the lid, and a warm brown shade which I tend to use on the outer corners and lower lash line. Two very simple colours, but they work great together and are lovely for everyday use. If I want a cream shadow I’ll always reach for the By Terry Ombre Black Star in Bronze Moon. These are so easy to apply and blend out, they literally take about 5 seconds! This shade is a dark bronze with shimmer running throughout. It defines the eyes so well and paired with lashings of mascara is a super simple look with maximum results. 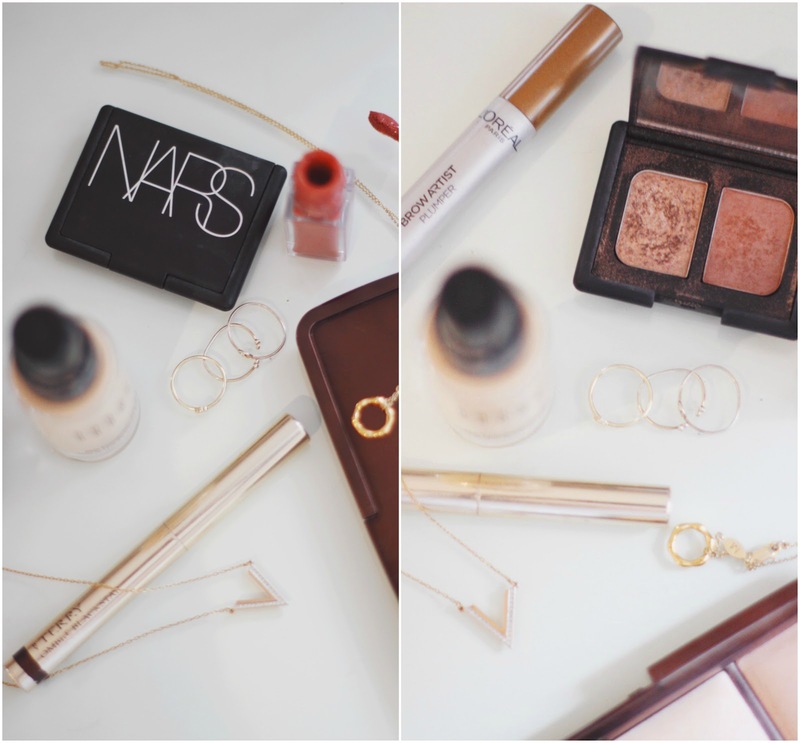 End of Summer Minimal Makeup Favourites. I wasn't really sure what to call this post...I didn't want to do a complete full face - you know with brows, mascara and all - but I also don't have a lot of new products to share. With that in mind, I thought I'd just do a quick rundown of some bits I'm currently really liking for this time of year, hence the all over the place title. Overall my makeup taste at this time of year is simple, quick, and I use products which can do it all. I love to grab a palette or two, a nice all over lid shade and a multipurpose base to give me a completed look using minimal products. For a quick base I simply mix the Charlotte Tilbury Hollywood Flawless Filter and the Bobbi Brown Skin Foundation. This concoction will leave your skin dewy, fresh, and flawless. I've seen a lot of mixed feelings about the CT Flawless Filter, and there seems to be a million and one ways to use it which I think is confusing some people. Personally I use it as a primer, one dunk and I swipe the applicator all over my face. It gives a beautiful glow to the skin, and a slight tint to get the makeup ball rolling. The Bobbi Brown foundation layers great on top to give a dash more coverage, so for me this is a no brainer. On my cheeks, surprise surprise, I'm using my much loved Hourglass Cream Cheek Trio which has been everywhere with me this summer. If you're a fan of cream products, this is 100% a palette you need in your collection. For my fair-medium skin tone all these shades work wonders. The bronzer adds a gorgeous shadow, the blush is the perfect pinky peach, and the highlighter is a lovely everyday shimmery shade. You can either go in with a light hand, or build up the intensity, which is a plus in my books as it's very user friendly. Another cream product I've been reaching for is the Glossier Cloud Paint in Beam. This is a lovely pale coral which is a perfect summer shade. You need such a small amount of these you wouldn't believe, but they blend beautifully and last really well on the cheeks. On my eyes I've been obsessed with the Charlotte Tilbury Cream Shadow in Marie Antoinette, it's the perfect bronze for me! These are so so easy to apply, you can either go in with a brush, or your fingers, both blend very well and apply a good amount of colour. This has a lovely sheen to it, without being full of glitter, it definitely leans more metallic. This is one of those one-shadow-wonders which I'm all about, they're the best thing for when you're in a rush. Let me know if there are any other shades of these you love as the formula gets a big thumbs up from me. Lastly, I can't not talk about a lip product, and you're a fan of a tinted balm, listen up! The Fresh Sugar Balms are some of my faves. They actually offer a really good whack of pigment for the type of of product they are, and for the amount of hydration they offer. I recently picked up the shade Tulip and it's a gorgeous deep pink shade, a really good transitional colour which I know I'm going to be wearing non-stop. Why I Always Double Cleanse. 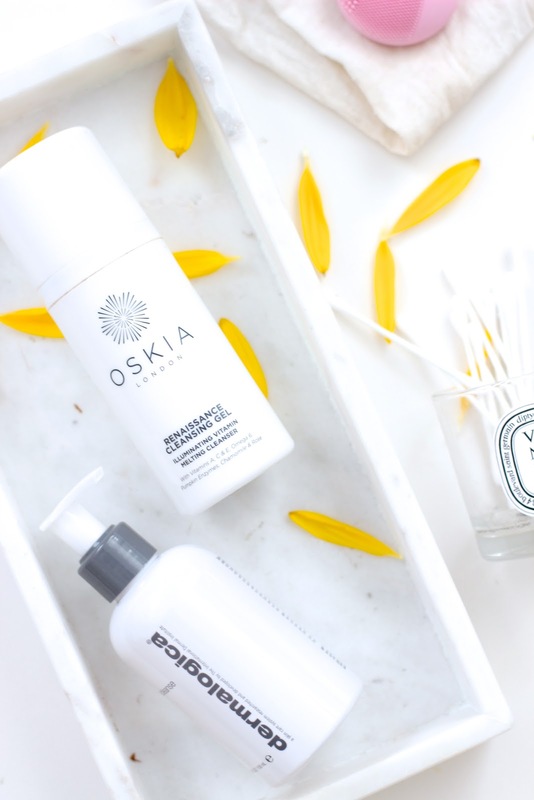 Skincare as a whole is a huge contributor to good skin, of course, we all know that by now. I'm partial to a luxury oil, or a savvy moisturiser, but at the end of the day if you're not cleansing you skin properly you may as well forget all that. Whether you wear makeup, or not, cleansing is a crucial first step to maintaing clear, and glowy skin and should not be skipped. Now double cleansing is one step further, and if you wear makeup day to day, listen up. No matter how effective you feel your makeup remover is, you'll be surprised at how much residue is actually left over. If you follow with a toner, you may already notice all that foundation-toned gunk which shows up on the cotton pad...it's not pretty. By following your makeup remover with another cleanser, you will dramatically reduce the amount of makeup left on the skin, and therefore leave a clean canvas for your other skincare to sit on top. When it comes to the first step, makeup removal, I'm a huge fan of either an oil or balm cleanser. I feel these work wonders for not only breaking down makeup, but leaving my skin feeling nourished afterwards. Now, this can lull you into a false sense of security by not feeling the need to follow with a second cleanse as your skin is already feeling amazing, but don't stop there. There are a lot of cleansing oils on the market these days, and I’ve been using the Dermalogica Precleanse over the past few days and I’m really loving it. It has a beautiful lightweight formula which breaks down makeup, and leaves your skin feeling clean and nourished, something I really look for in a makeup remover – I can’t stand that tight/stripped feeling some leave. The smell of this is absolutely divine, it’s like you’re having a facial at your favourite spa, it’s very very calming. One pump does the job for me, I simply massage it in then rinse away with warm water. As the smell is truly spa like, this would also make a great evening cleanser, even if you don’t wear makeup! To follow that I have a few cleansers which I keep in my bathroom at all times. 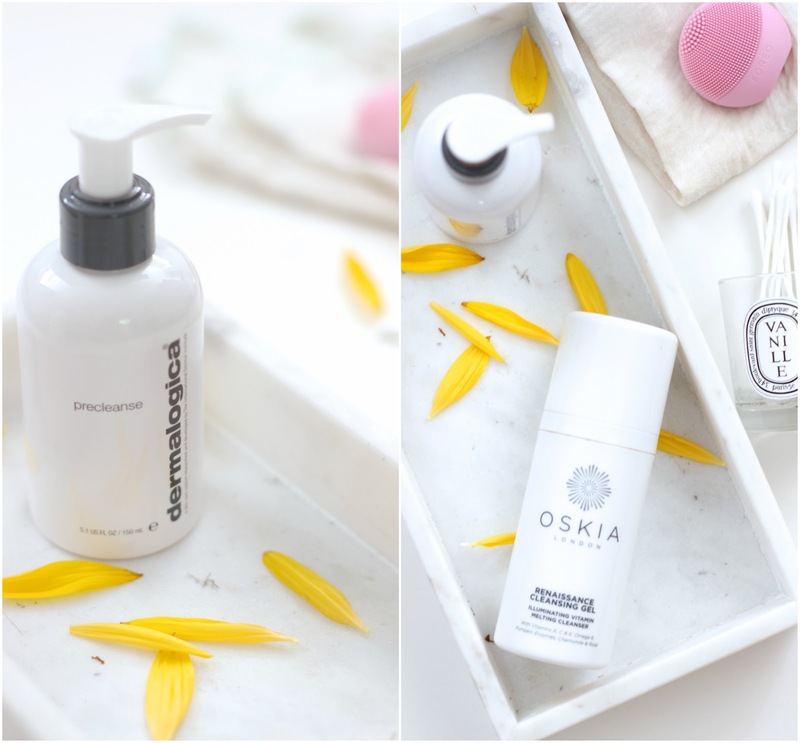 The one I’m mentioning today is the much loved Oskia Renaissance Cleansing Gel. I’m sure you’ve heard everyone and their dog talk about this stuff, but for good reason, it’s a bloody beauty. I take a couple of pumps and massage that in with my Foreo Luna to ensure I’m really getting a good, deep cleanse. Once you start to mix this with water it transforms into a beautiful creamy texture which will leave your skin brightened and hydrated. This is also a good cleasner to use in the morning as it always leaves a nice glow to the complexion. If you suffer with blackheads, or texture on the skin, a Foreo is a great little gadget to invest in! It will make your cleasner work that little bit harder, and give you better results. I’m obsessed with mine!